I didn’t photograph the process because I didn’t think of writing it up till after I was all done. 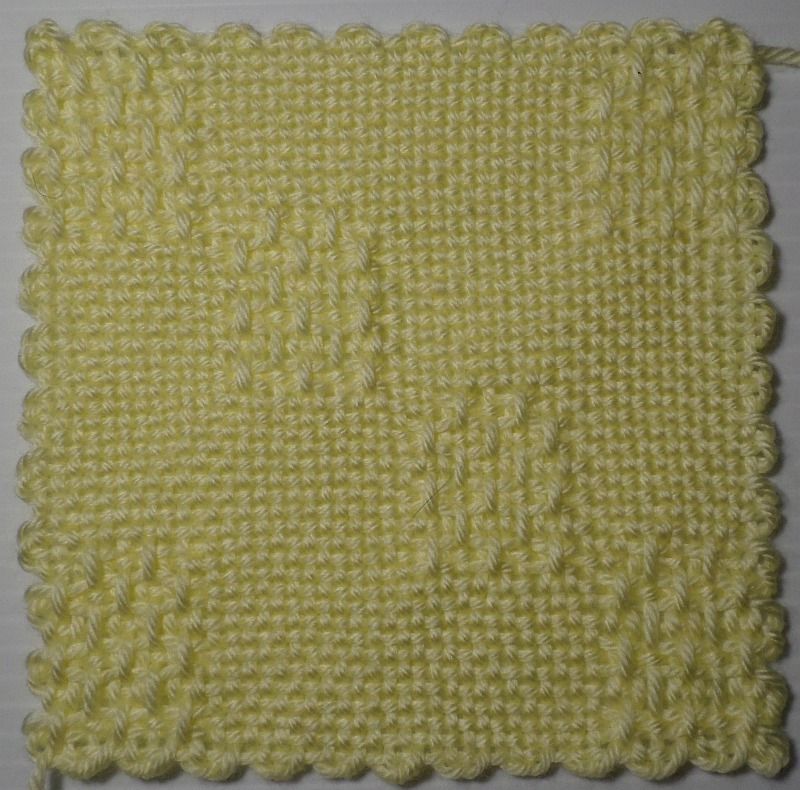 The problem was, I’d completed a 6″ square and removed it from the loom before I realized my mistake. The red circle shows the part of the pattern I’d left out. That corner was plain woven before the square went back on the loom. An unhappy alternative lay before me: leave the mistake in and scrap the square (with its 17 yards of yarn), attempt to fix it off the loom (truly unthinkable! ), or put it back on the loom. In all these few years of pin loom weaving, I’d never attempted to put a whole square back on the loom, so . . . 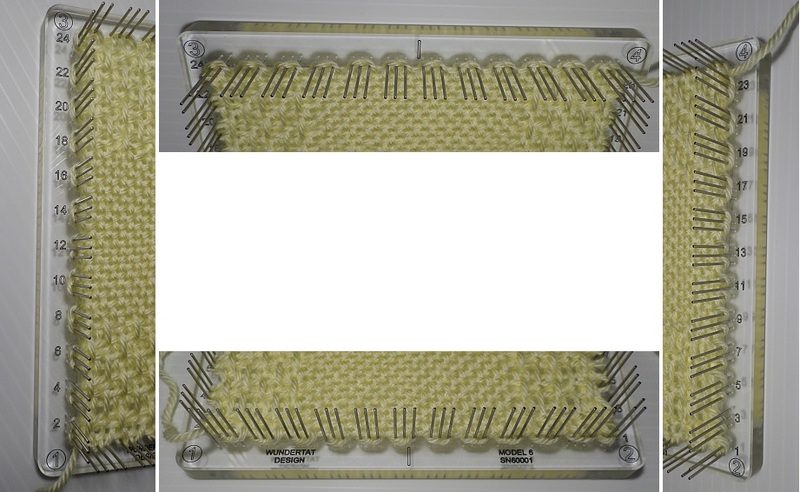 This photo shows close-ups of the four edges of the loom. Because the mistake was in the top quarter of the square, I only took care to place certain loops in their totally correct positions. I placed the top and bottom edges in the right places, but not the lower parts of the sides. I used my trusty size B (2.25 mm) crochet hook for the whole replacement process. Unweaving was as “easy” as it always is and reweaving was a breeze. All in all it probably took less time to put the square back on the loom and correct it than it does to warp the loom and weave a square. It wasn’t frustrating at all (I had another 6″ loom nearby all warped up, which helped me know where the loops should be placed, but obviously a 4″ or 2″ loom would work just as well—or even a diagram). 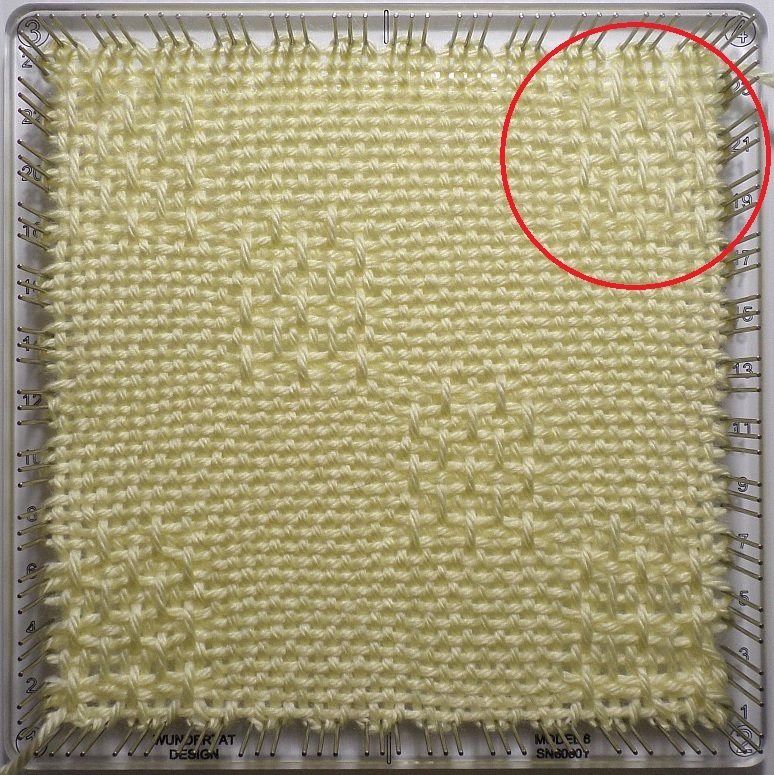 Next time you spot a major error and yarn waste is a consideration, you might want to give this technique a try. You stepped up to the challenge and did it! Nice save and best of all knowing you can put it back on the loom and correct your mistake. Thanks Cheryl! I agree it’s great to know that putting it back on the loom can be done. Let’s just hope I don’t have to re-prove it too often . . .